The best of the finest cottons. But produces extremely long thin fibres. With this kind of Egyptian cotton named GIZA 45+ you have the guarantee that every fibre inside has at least 45mm. length. Having said this take in mind that most cotton on the marked is only 38mm long. 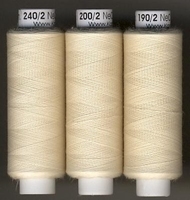 This range is made specialy for the finer laces and other more requiering textile techniques. take it as mother nature intended it like a perfect creation of pure luxuriuos fibres. If mother nature made somethingh compleet, whit all it should be, whom are we to try to make it differend? a very nice touch of nature in cream cotton colour. Not only for this cotton but for practicly all we do we tend to avoid all possible chemical bazaar. in short: whit cotton is alwaus les stronger then natural state colour cotton.